Australian angler Ryan started his Thailand fishing holiday with a visit to Palm Tree Lagoon in Ratchaburi. On arrival at the lake the angler was soon fishing two rods over a large baited area in the centre of the lake. Ryan was soon into small catfish on the carp rods landing several striped catfish. After a lull in the action a high speed take saw the angler attached to a much better fish. With large swirls appearing out in the lake it was clear that Ryan had hooked a Giant Siamese Carp. The carp powered up and down the lake on a series of powerful runs before finally being netted ten minutes later. 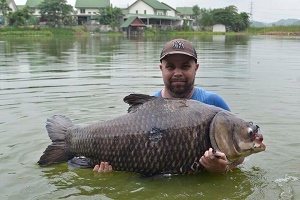 The Giant Siamese Carp was estimated to weigh 45-50kg and was quickly released after trophy shots. Ryan continued fishing into the afternoon and was soon rewarded with some predator action on a deadbait cast into a quiet corner of the lake. In the later part of the day the carp rods remained silent, but a series of Redtail Catfish between 30-35kg were landed on the predator outfit.